ENDURACAT™ is a high performance, interior, ultra-low VOC, pre-catalyzed, single component, water-based, acrylic epoxy. It has superior adhesion and excellent chemical resistance and washability. It can be used on properly prepared interior metal, wood, drywall and masonry. It is intended for use on interior, high maintenance, institutional or commercial areas like hospitals, schools, hotels and cafeterias, where extra durability and chemical resistance is required. In testing versus competitors, ENDURACAT™ shows superior resistance to film damage such as blistering and peeling when exposed to harsh chemicals. The test coating is applied to a white scrub panel with a 3 mil bird bar and cured for 7 days. After 7 days, the panel is tested for its chemical resistance to Fantastik, Isopropyl Alcohol, and bleach. Each chemical is applied using a 1 inch double over cheesecloth soaked with 1 mL of solution. The cheesecloth is placed over the index finger and the panel is rubbed for 50 cycles in a circular motion. After chemicals are applied the film is examined for any lifting, wrinkling or other defects. Picture shown above demonstrates the results of testing for a solution of 70% Isopropyl alcohol. 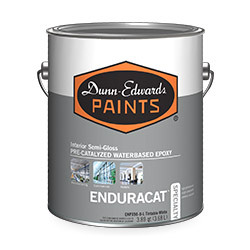 It is always recommended that ENDURACAT™ be used over properly prepared and primed surfaces.